There are many items in the house that cat owners should make sure their cats don’t consume, some perhaps less obvious than one might expect. What follows is a brief rundown of some of these edible dangers. For a complete list of foods toxic to your cat, consult your veterinarian. This is another potentially fatal drug to cats, found in coffee, tea, chocolate, cocoa, energy and soft drinks and more. Caffeine can lead to heart palpitations, restlessness, fits… sound familiar? These are a few of the symptoms of caffeine poisoning in cats, but also fast breathing and muscle tremors. Perhaps most troublesome in this case, there is no cure for caffeine. Many times we don’t know what we eat because we don’t read the ingredients on the packaging. With candy, one of those ingredients that we might not always recognise can be lethal. Xylitol, a sweetener used in many things, can produce liver failure in cats. The theobromine in chocolate is toxic to cats as well as dogs, too much of it can result in death. Keep chocolate away from all pets. At least, thankfully, cats are less likely than their canine compatriots to seek the sweet treat on their own. 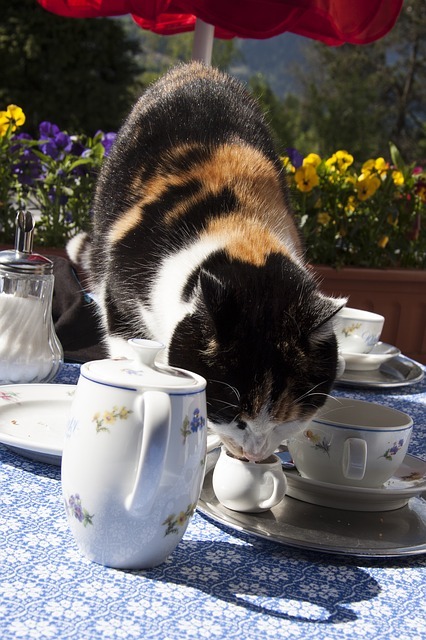 Believe it or not, cats are lactose-intolerant. A little dairy can result in a lot of diarrhea. Raw foods like fish can carry bacteria such as E. coli, resulting in food poisoning in cats just as it would in humans. Raw fish also can cause neurological disorders by attacking the body’s thiamine (vitamin B1). As with dogs, grapes and raisins are toxic to cats too, potentially causing kidney failure. Cats might enjoy chasing them across the floor given the opportunity, but keep the grapes away. While not a food, definitely worth mentioning. Never treat a cat with human medicine unless under strict instruction from your veterinarian. Poisoning cases for cats that have consumed pain relievers and anti-inflammatories are all too common, in spite of their owners best intentions. If a pet ever needs medication, talk to your regular vet. All types and forms of onion, including garlic, can cause serious harm to a cat. Foods of the onion species create gastrointestinal upset and can even deplete red blood cells in felines, severely diminishing the body’s ability to carry oxygen through the bloodstream (anemia). A steady diet of tuna does not give a cat the nutrients it needs to thrive and could even result in mercury poisoning in some cases. A tiny amount now and then as a treat, however, is likely okay.